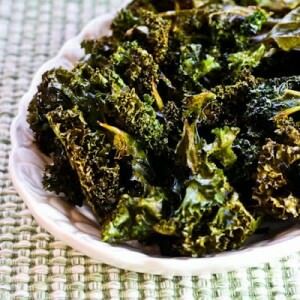 1 bunch kale – wash, remove stems, and tear into 3 to 4 inch pieces. Heat oven to 375 degrees. Mix vinegar and oil, pour over kale and toss to coat. Sprinkle in the nutritional yeast and salt. Toss again until kale is evenly coated. Spread onto a baking sheet, and bake for approximately 15 minutes or until crispy and brown around the edges. Enjoy by themselves, or try crumbling them up over baked potatoes, pasta dishes, or salads. 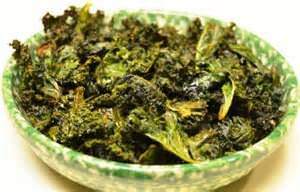 Alternately you can use a dehydrator to cure your kale chips, about 110 degrees is a good temperature and you would just increase the time to about 3 to 4 hours. Kale is one of the hottest trending food items right now, in restaurants, its the talk of the town in cities large and small all over the United States. With kale being one of the world’s healthiest foods, it’s no wonder restaurants are adding it to their menus as part of a healthier offering to keep up with this new demand of not only kale but other leafy green products with superior nutritional value. People are discovering the high nutritional value of the dark leafy green and the thousands of recipes that are available online for everything from raw kale salads to cooked kale casseroles and how well it goes with their regular meals. Many are starting to add these highly nutritious leafy greens to their dinner table on a daily basis. I have been preparing this Asian kale salad for many years and have served it in my restaurants and has been a successful dish. It is not only tasty but healthy and is prepared with all natural and organic ingredients and is in accord with my training as a macrobiotic chef. I hope you enjoy it as much as my customers have enjoyed it. 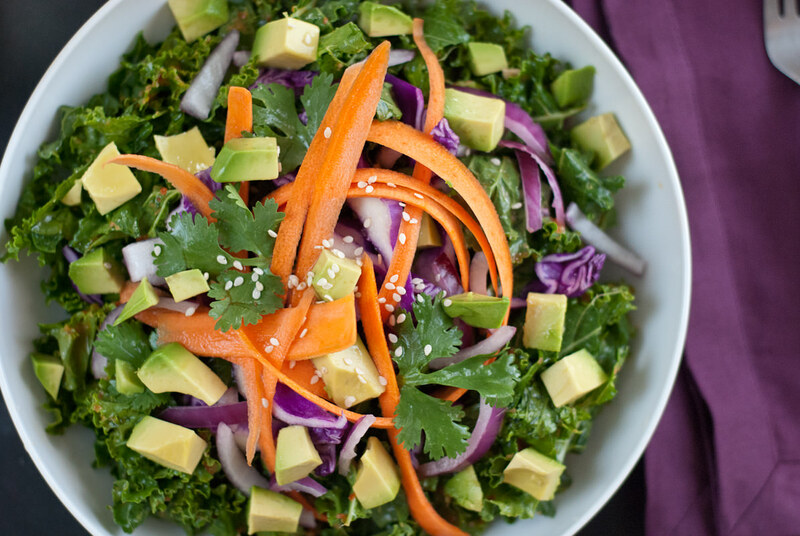 This healthy Asian kale salad tastes especially best when it is made 1 hour prior to serving if you have the time, however can be served anytime. I always recommend organic when possible, this not only tastes superior but you can count on it having little or no bad elements like pesticides. 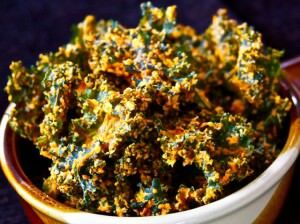 Place the kale in a large bowl and add small amount of oil and massage the kale. You can always add a little extra sesame oil or tamari to taste before eating. Serve cooled as a perfect lunch or dinner time addition or eat on its own as a meal. Be creative and add a few of your own toppings to it and see how pretty you can make it look for your dinner table. 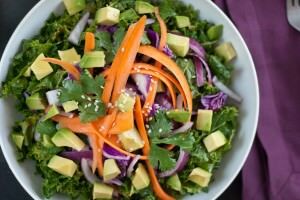 One thing for sure is that Kale salads are one of the healthiest choices for your diet and will keep you feeling and looking youthful and alive. Copyright ©2019 Thai Spices Natural Restaurant. All rights reserved.